Researchers from the University of the Sunshine Coast have been working with staff at a Queensland high school to ensure student voice is an integral part in the development of student leadership programs. In today’s reader submission, they share details of the small-scale study and its findings. School staff requested collaboration with university researchers to gather data for designing evidence-based, high school student leadership programs, which could be attractive to students who have not previously shown interest. This project involved analysis of the literature, and provided perspectives directly from Year 10 student focus groups. The development of leadership in school student populations en masse is considered to be a positive means of increasing personal, academic, and wellbeing outcomes for students and a further means of enhancing socioeconomic benefits (Hallinger, 2003; Leithwood, 1992; Marsh, 2012). The few reports in the literature documenting outcomes from school leadership development programs do indicate a range of positive outcomes. Teachers reported that their own leadership training increased confidence in facing daily challenges, and improved their skills, which potentially imparts positive mentorship-effects to students (Leithwood, 1992). The Greater New Orleans School Leadership Centre’s innovative leadership program, which aimed to empirically demonstrate that mentorship could improve student learning, was subject to a four-and-a-half-year external evaluation (Leithwood, Riedlinger, Bauer & Jantzi, 2003). The primary finding was that mentorship drove the success of the leadership program, which was heavily reliant on teachers’ mentorship qualities. After reviewing literature on programs that mentor student leadership, Renée Westlake (2015) developed a four-point working model, comprised of: leadership practices, leadership theory, behaviours related to identity, and 21st century skills. He found that common outcomes when student leadership was mentored were enhanced: citizenship, communication, collaboration, representation of the group, and modelling the way for others. A North American study followed 11 high school students through a leadership program (Steinkamp, 2016), and found that all participants sought post-secondary education and continued service. Connie North (2007) found that the understanding that develops from program practices of self-appraisal, self-acceptance, and the acceptance of others, can inspire application of creative thinking to problems. Outdoor-based adventure leadership programs affected change in high school students (Johnson, 2012). Participation in fine arts programs has also been found to contribute to the development of leadership (Burge, 2015; Farb & Matjasko, 2012). Gretchen Brion-Meisels (2015) suggests that a deficit in student leadership programs is the absence of significant input from the students, arguing that making student views the centrepiece of support systems will develop enhanced outcomes. Ari Sussman’s (2015) New York City high school leadership program – the Student Voice Collaborative (SVC) – emphasises the partnership between students, teachers, principals, and administrators. Students attain leadership development as well as self-confidence and self-esteem through accomplishments and processes of collaborative change (Sussman, 2015). The nine principles of the SVC model are: storytelling, make change from the inside out, sketch and follow a roadmap, encourage imaginative unchecked solutions and then check them, know the system in order to impact it, move the work from the shadows to centre stage, make clear what you want to see, assume the best intentions of leaders and policy makers, and work closely with principals who set the tone. The concept of using ongoing cohorts in leadership programs presents an opportunity to create micro-groups of students that remain together throughout their school program (Barnett, Basom, Yerkes, & Norris, 2000). Cohorts encourage bonding, teamwork, empathy, professionalism, and respect, while also easing aspects of administrative burden (Georgia State University, 2015; Wituk, Ealey, Clark, Heiny & Meissne, 2005). Both staff and student perspectives should be considered in program planning and evaluations. It is noteworthy that the literature provides little of direct feedback from students. Understanding student perspectives may be crucial for planning programs that will be attractive to a wide range of student interests and abilities. What did our study involve? We carried out a qualitative investigation of student perceptions, gathered through three Year 10 student focus groups. Sixteen students, with an average age of 15 and from the same high school in Brisbane, participated in the focus groups. Thematic analysis (Braun & Clarke, 2012) of focus group transcripts, enabled the identification of shared themes. To reduce student hesitations in providing authentic perspectives, the focus groups were held at a university campus and were facilitated by university researchers, with no school staff in attendance. Confidentiality of responses was assured as researchers did not know student names. The students were vocal, thoughtful and willing to share both general and specific perceptions and creative ideas on leadership development. Six major themes were identified. While most of the themes are not surprising, they do represent real current student perspectives. Figure 1 shows an overview of the themes and sub-themes. Each of the six themes is explored in further detail below. Students identified positive qualities of a good leader: being inspirational, courageous, and confident in what they know and believe in. Good leaders are optimistic, passionate, knowledgeable, and able to use their knowledge to help others, trustworthy, loyal, reliable, self-and-other responsible, genuinely interested in people and their needs, supportive, and empathic. The capacities of good leaders were: being able to take criticism positively, stand-out as a person, lead groups, enjoy being a leader, guide and support people, are balanced and ethical, speak publicly, avoid making uneducated assumptions, and use their intelligence. The skills of good leaders primarily include communication and social skills. Social skills were seen as important and described as the ability to ‘encourage and support all’. Additionally, good leaders can guide others, apply knowledge well, and possess organisational skills. They are able to understand what needs to be done, but listen to others and delegate as well. They are also seen as having important time management skills. Students considered that genuine leadership skills are rare, uncommon or lacking in society. There was a pervading sense of lack of confidence that good leaders did exist. Good leaders are: people who listen and respect, such as parents and school captains. Some teachers are leaders in the classroom, as are some school principals. A number of American and international leaders were identified, however, famous Australian examples were notably absent. Bad leaders are: dictators; people who do not listen, and use fear and force; people who lead for personal gain, giving little back; people who are unavailable; politicians and some government officials. There was agreement that some people have a knack for leadership. Others find courage and then learn leadership. Some need longer to learn. Some have confidence in one area but not in others – for example, a sports leader may not have social confidence. Leadership can be learned through: observing good leaders, identifying mentors, spreading leadership skills throughout the curriculum; creating small activity groups to enhance individual involvement, and providing more peer teaching. Students wanted the school to provide more practical activities, more practice in public speaking, more opportunities to become leaders, developing students’ skills in ways that don’t advertise ‘leadership’. In order to increase interest, programs need to be more considerate of student time, so that potential leaders do not fall behind in the classroom. To encourage students who normally would not go near a leadership program, suggestions were made about offering rewards for attending. ‘These could include some out-of-class physical activity, food, or social fun’. ‘A certificate for attending, and an ending party, and time out of normal classes would be an incentive’. Calling the program something to do with ‘psychology’ and how to better understand people would help. Students clearly shared a belief that leadership development can be negatively influenced by teachers. Students felt that some teachers do the leader’s work, instead of allowing leaders to do it. It was considered important that teachers be non-judgemental of students who have shown difficult behaviours. The young participants in this small study indicated an interest to be mentored and learning to provide mentoring for younger peers. Teachers involved in leadership programs need preparation, motivation, training and mentoring, in order to model leadership ideals. The student perception that leadership can be learned correlates with the literature, and is cause for optimism in planning, as well as an assurance that many will perceive the relevance of leadership programs. 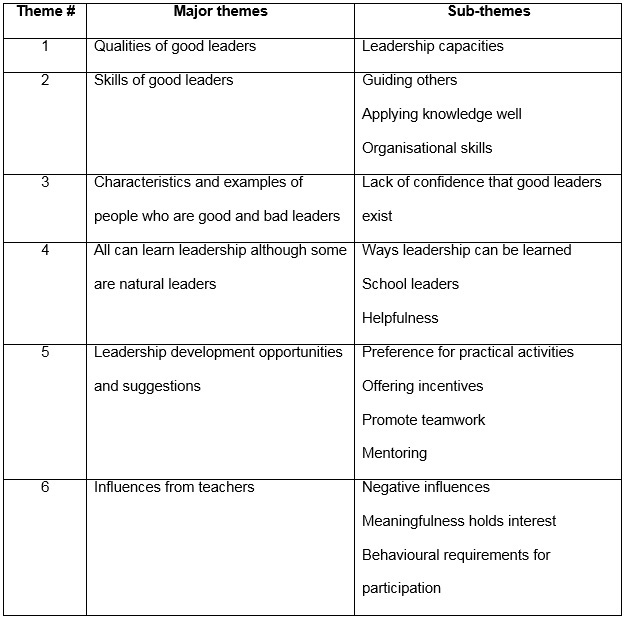 Student insight in naming good and bad leadership qualities and capacities suggests that there are opportunities for the expression and exchange of views, that are then respected through contributing to curriculum development. Both the literature and the staff at the school that was the focus of this study, grapple with questions about leadership program models, as well as the availability of tested models. Student perceptions suggest that for a model to be successfully engaging it needs to have a strongly humanistic foundation, with respect, honesty, fairness, as well as firm guidance, and also appeal to students’ innate positive values. However, some student voices suggested the possibility of not focusing on ‘programs’, but integrating leadership teaching across the curriculum. Students prefer more autonomy in the programs. They believe they should be more responsible for decision-making, problem solving, and creativity. They saw the need to make the activities and leadership development meaningful. They needed more exposure to the leaders in the school, and there should be more exposure for younger students to older leaders. There was agreement that leadership programs should be available from an early age and continue throughout high school. Students were not all in agreement about whether student leaders should be rule followers or willing to think differently. The belief was expressed that everyone should have the opportunity to lead, using their own strengths. Overall, students recommended incorporating into leadership programs concepts, activities and experiences of achievements that are meaningful. It appeared that programs that might provide practical outcomes, as well as engaging emotional intelligence, would be favoured. There appeared to be a hunger among students for the development of kindness, peer acceptance, peer support, and non-judgement from teachers. Data gathering was limited in this small study to feedback from three focus groups (a total of 16 participants, all from Year 10). While this limits the generalisability of the findings, the study does illuminate real and current student perspectives. Barnett, B. G., Basom, M. R., Yerkes, D. M., & Norris, C. J. (2000). Cohorts in educational leadership programs: Benefits, difficulties, and the potential for developing school leaders. Educational Administration Quarterly, 36(2), 255-282. Braun, V., & Clarke, V. (2012). Thematic analysis, In H. Cooper (Ed). The APA handbook of research methods in psychology: Vol. 2. Research designs (pp. 57-71). Washington DC: American Psychological Association. Brion-Meisels, G. (2015). Centering students in school-based support processes: Critical enquires and shifting perspectives. Teachers College Record, 117(13), 67-82. Burge, H. B. (2015). High school students' participation in fine arts programs and perceived leadership self-efficacy (doctoral dissertation). Walden University, Minneapolis, USA. Farb, A. F., & Matjasko, J. L. (2012). Recent advances in research on school-based extracurricular activities and adolescent development. Developmental Review, 32(1), 1-48. Johnson, J. W. (2012). The effect of high school outdoor-based adventure leadership programs in independent schools on personal effectiveness and locus of control (master’s thesis). Prescott College, Arizona, USA. Leithwood, K. A. (1992). The move toward transformational leadership. Educational Leadership, 49(5), 8-12. Leithwood, K., Riedlinger, B., Bauer, S., & Jantzi, D. (2003). Leadership program effects on student learning: The case of the Greater New Orleans School Leadership Center. Journal of School Leadership, 13(6), 707-738. Marsh, S. (2012). Improving student learning in schools: Exploring leadership for learning as a community activity. Leading & Managing, 18(1), 107-121. North, C. E. (2007). What do you mean by ‘anti-oppressive education’? Student interpretations of a high school leadership program. International Journal of Qualitative Studies in Education, 20(1), 73-97. Steinkamp, L. A. (2016). Cultivating post-secondary opportunity and service: Youth and young adult perspectives on a high school leadership program (doctoral dissertation). The University of Wisconsin, Madison, Wisconsin, USA. Sussman, A. (2015). The Student Voice Collaborative: An effort to systematize student participation in school and district improvement. Teachers College Record, 117(13), 119-134. Westlake, R. E. (2015). Mentoring student leadership: A comparison of two high school programs and the development of student success (doctoral dissertation). Montana State University, Bozeman, Montana, USA. Wituk, S., Ealey, S., Clark, M. J., Heiny, P., & Meissen, G., (2005). Community development through Community Leadership Programs: Insights from a statewide community leadership initiative. Community Development, 36(2), 89-101. What role does student (in addition to staff) voice play in the planning, implementation and development of programs in your school? This small-scale study found students wanted more autonomy in leadership programs. Are you a teacher involved in a student leadership program at your school? Do you step back and allow students to demonstrate their skills by driving the program and its activities?